This is a version of Google Maps 2.3.2 for touch screen phones. It doesn’t seem to work on phones without touchscreens, use the non-touch version instead. 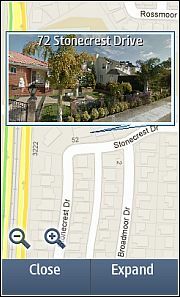 This version has map and satelite view, traffic, directions and street view. The app “Google Maps” (436 KB) is ready to download or send to your phone as filename:”GMaps2Touch”. add me. for those willing to be my friend. i have SAMSUNG GT-C3312 , Its not working and Why its not working . Thank you for your report. Mot all apps work on all phones. I’ve added the SAMSUNG GT-C3312 to the post’s “not working on…” list. The Facebook app is here http://boostapps.com/apps/facebook-3-4-1/ It’s resolution independent. Its works better thanks denis. this costs minutes to use on tracfone…however was supposed to get free browser time…why?? Browsing and data use are not free on TracFone. Where did you get the idea that they are free? Browsing is only free on WiFi. I have a LG Rumor Relfex, and app works great. Thanks Dennis your a real help. I really hope you get paid for doing all this. The virtual keyboard should be hidden with the version of Google Maps on this page. If it isn’t hidden on your phone reply with the phone’s make and model and I’ll see if I can fix it.